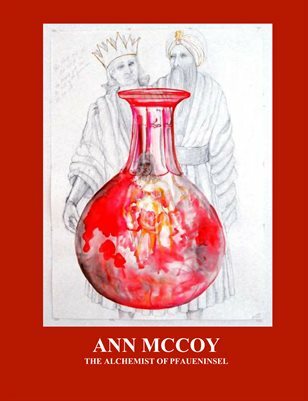 An alchemical fairy tale written by artist Ann McCoy with paintings depicting the tale by the artist. This fairy tale takes place on an island off Berlin called Pfaueninsel (Peacock Island). The island was the home of Johaan Kunckel, an alchemist who made red glass. "For me the Ruby Glass was a perfect symbol of the rubedo (the red stage if the alchemical process), when passion and pneuma, spirit and a devotion to the heart (feeling) enters the process. The fairy tale takes place during a period like the Hundred Year War. We are living in an age of perpetual war now. In some ways this fairy tale suggests an answer to this dilemma."